The Joint Base Cape Cod (JBCC) is a full scale, joint-use base home to five military commands training for missions at home and overseas, conducting airborne search and rescue missions, and intelligence command and control. 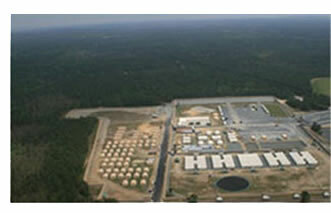 To the right is an aerial photo of Tactical Training Base (TTB) Kelley, dedicated to SGT Michael J. Kelley. The training base replicates a forward operating base soldiers occupy when deployed overseas in places like Afghanistan. 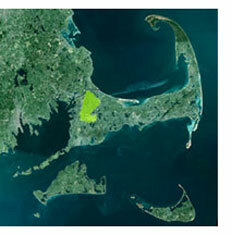 The sea of green in the background is the northern training area of Camp Edwards, home to the Upper Cape Water Supply Reserve; the largest piece of protected, undeveloped land on Cape Cod. 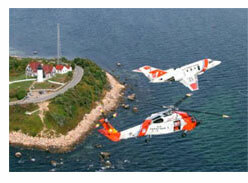 Both are used jointly for training by the Massachusetts Army and Air National Guard and the U.S. Coast Guard. 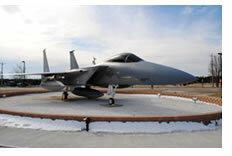 Honoring its past mission, the 102nd Intelligence Wing has erected a retired F-15 Eagle jet for display outside the gates of Otis Air National Guard base. The current mission of the intelligence wing is to provide world-wide precision intelligence and command and control along with trained and experienced Airmen for expeditionary combat support an d homeland security. U.S. Coast Guard Base Cape Cod is the Coast Guard's primary tenant command within Joint Base Cape Cod (JBCC). Established in August 2014, U.S. Coast Guard Base Cape Cod serves as the single DCMS touch point for the support of Coast Guard operations within the 1st Coast Guard District, standing shoulder-to-shoulder with operational partners to ensure the delivery of professional, responsive and cost-effective services to the American public. With the shift in support services to Base Cape Cod, all services and support oriented departments are now located at Base Cape Cod. Air Station Cape Cod (ASCC), with its three helicopters and four jets, is the only Coast Guard Aviation facility in the northeast. ASCC is responsible for the waters from New Jersey to the Canadian border and maintains the ability to launch a helicopter and/or jet within 30 minutes of a call, 365 days-a-year, 24 hours-a-day, and in nearly any weather condition. Soldiers training for deployment at Camp Edwards, the primary military training facility for National Guard and Army Reserve soldiers throughout New England. Camp Edwards' primary mission is to prepare soldiers for combat missions overseas as well as missions to serve and protect the homeland stateside. The JBCC supports a wide range of training for homeland defense and security missions needs for the various commands as well as large scale joint training exercises with both military and civilian first responder participation. 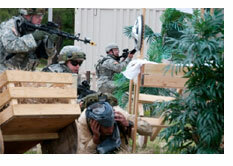 The picture at the right shows bomb sniffing dogs training at Camp Edwards in May of 2010. 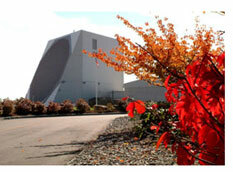 Cape Cod Air Force Station is the only land based radar site providing missile warning for the eastern coast of the United States and southern Canada against intercontinental and sea-launched ballistic missiles. The JBCC is home to many other tenants and programs, to learn more please visit our Overview page.